Digital data has become a classic big data challenge for marketers who want to push past the retroactive analysis limitations of traditional web analytics. The opportunity for digital intelligence has arrived, as traditional web analytics techniques were not designed for the breadth of channels and devices or the pace of adoption that fuels consumer experiences. At the same time, innovations in data visualization and advanced analytics are dramatically changing our ability to process very large amounts of multichannel information. The democratization of analytics is upon us, and marketers have an unprecedented opportunity to take advantage of descriptive, predictive and – most importantly – prescriptive, data-driven insights. 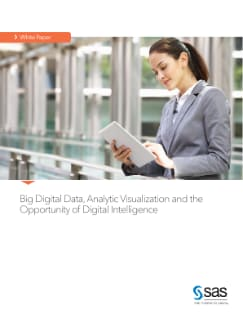 This paper explores these concepts and looks at how SAS Adaptive Customer Experience and SAS Visual Analytics can help you overcome the limitations of web analytics and support data-driven, integrated marketing objectives.